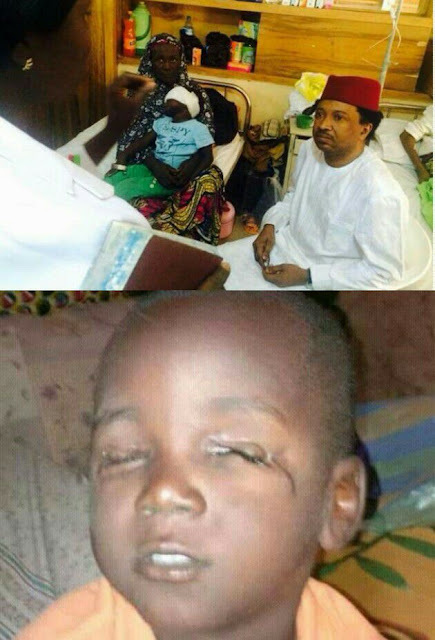 Senator Shehu Sani has been called out for not honouring a pledge he made to sponsor Sadiq Abubakar Isa, the 4-year-old boy whose eyes were plucked out by ritualists in Zaria, Kaduna state last year. Dear Senator Shehu Sani, When the eyes of this hapless boy were gouged last year, you quickly rushed to the hospital and made a pledge that you will foot the medical bills of the boy and you will sponsor him to abroad (after you heard that Elrufai sent delegation to go and assist the boy) There are many people who were willing to assist the boy, but when they heard that you had taken the responsibility of further treatment abroad they all backed up. Now its one year since you made that promise yet you refuse to fulfill. You played politics with the boy's affliction just to score a cheap political point against El-Rufai and now you left they boy and his parents in pain. I wonder why you will so self-centered and heartless about the boy's affliction.